Dimension One spas have an unbelievable number of innovative interior features. Every one of them is designed to enhance your hot tub experience. From impressive convenience features to luxurious hydrotherapy massages your D1 hot tub will no doubt deliver in every aspect. D1 has patented the only adjustable neck pillow in the industry. The neck pillow can adjust to comfortably accommodate anyone from 5’2”-6’6” and contains two powerful jets that are embedded into a curved, padded head cradle for maximum comfort and perfect massage positioning. Our Bay and Reflections Collections offer a newly redesigned Flextherapy pillow that has all of the impressive features of the jet therapy pillow, but with three adjustable neck and shoulder jets embedded in the pillow to really hit every spot. D1’s patented accent jets are fully adjustable and interchangeable with just a simple twist you can create a custom massage. These jets have a unique shape unlike anything else available in the industry. D1s also have Typhoon jets in the foot wells to target key massage points in your legs, calves and feet. The interior surface of your hot tub should be the most durable and comfortable material available because it is the part of your tub that is most exposed and most touched. Dimension One has an exclusive Ultralife material featuring a unique slip-resistant surface that is unmatched in the industry and has a lifetime warranty. You can’t beat that. D1s design team out did themselves when they created the principles of hydronomics to develop a “no float” seat. It uses seating angles that use optimum body positioning so you actually stay in your seat; no drifting around above it. As if Bioform seating wasn’t enough, the design team took it one step further creating the “spa-within-a-spa” Ultralounge massage seat. It provides head to toe massage action so you can enjoy whole body hydrotherapy. It, too, has the “no float” design, but also features sculpted leg contours and tactile therapy for your wrists and hands. If you are looking for the ultimate in convenience look no further than the Echo. It is an exclusive magnetic switch that allows you to control all of the major features of your hot tub from an underwater switch. That’s right, you can control your hot tub without ever taking your hand out of the warm, relaxing water. 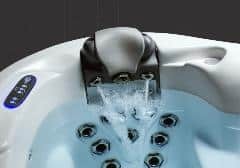 The Dynamic Massage Sequencer offers six pre-programmed massage sequences that turn an everyday hot tub soak into a full-body hydrotherapy experience. It has a digital control panel that includes an active therapy display, pause control so you can focus on target areas, and speed control. All of this from a silent valve operation so your relaxation is not interrupted by loud motor noises. D1 also features a full color touch screen control that manages all of the major hot tub functions from an icon driven menu. The Smart Hub has True Smart Touch that makes it easy to use even with wet hands. You can tap or swipe to adjust the temperature, jet settings, filter programing and even your sound system. Dimension One spas also feature tactile therapy, which is basically different sized therapeutic “bumps” that are grouped to target key acupressure points in your arms, hands, wrists and feet. Providing you with not only a hydrotherapy massage, but an acupressure massage as well. Liquid FX and Crystal FX are both lighting systems that are available on Dimension One spas. They both offer longlife jewel tone LEDs to help set the mood in your hot tub. Liquid FX combines the use of light, shadows and fountains to create the perfect environment. While Crystal FX uses the principles of chromotherapy in its two preset light shows to create a calm, soothing experience or a vibrant rejuvenating one. If all of these innovative features haven’t sold you on a Dimension One hot tub come by our Aqua Pools showroom and see these impressive features for yourself. We know you will fall in love with convenience and luxury of a D1 spa.